Ability: How good is the player at football? Probably the criteria we care least about, but it certainly won’t take any weight off a player’s rating if they are, supposedly, actually good at football. Because some African Football Aficionados will confidently argue that some of the players in this XI are better than Messi and Ronaldo combined; it’s just that the work permit criteria in the UK and the anti-immigration sentiment in Europe finds them still stuck Al Hilal Omdurman. Career path: Played for Real Madrid, Barcelona, Bayern Munich or any other European ‘super club’? You’re not part of this conversation. Played in The Best League in the World, the English Premier League? Puke! Rejected an international call up because you wanted to focus on club football? Disgraceful! Played for 15 clubs, strutting your stuff in the Congolese, Norwegian and Papua New Guinean leagues in an attacking midfield role? MashaAllah! The more unconventional the career, the higher the rating. Hairstyle: The hipster footballer isn’t supposed to look like a default office worker. If Andres Iniesta was African and playing for Barrack Young Controllers in Liberia, his hairstyle would significantly hinder his chances of making this esteemed XI. If the player’s hairstyle is likely to get them sent home from work, or ignite the ire of Your Dad or Mum, it does no harm to his chances of making this XI. Arguably the hipterest of the players on this list. Not many other players in this XI are simultaneously bona-fide continental creme de la creme for club and international superstars for country. Familiar yet elusive, the only way to catch Kidiaba, outside of an AFCON, is through the grainiest of streams, to the detriment of your eyesight. Fortunately, each time the hipster manages to tune in Kidiaba makes it worth it, often proving that Manuel Neuer still has some way to go to topple him as the best goalkeeper in the world. Kidiaba’s showmanship, particularly his bum-shuffle celebration, makes him a viral sensation and one of the few goalkeepers in the world people would pay to watch. His career in Africa has shown he’s too good for the continent, and perhaps – the horror! – even good at football, but he’s never made the jump to Europe, comfortably sealing his place as the custodian of this team. “Man was born free, but everywhere he is chains,” famously said Jean-Jacques Gosseaux back in the 18th century. A dogged defensive midfielder by trade, Gosso was parachuted to right-back to add sturdiness into a ropey back line at AFCON 2012, glittering the right flank with his white boots and unconventional, daredevil defending. Having entered the tournament as the most unknown player in the Ivorian XI, he would end up in the team of the tournament. We have not seen him in the Ivory Coast shirt since 2013, but he does exist, plying his trade in the second tier in Turkey, adding to career that has seen him play in Morocco and Israel. Gosso was such a hit back in 2013 that he was fictitiously interviewed by SFG. Three years in Vietnam, a year in South Korea, and now with Tanzanian giants Young Africans. Bossou’s career path reads like that of a millennial ticking off placement years as part of Sandals For Goalposts’ graduate programme. A regular in the Togo squad, his finest hour came when he shackled Didier Drogba at the 2013 Cup of Nations. What’s more, he’s the anti-Emmanuel Adebayor, Asamoah Gyan and Arouna Kone; playing at centre back hasn’t stopped him wearing the No.9 shirt with pride for club and country. Regarded a major flop in his initial months in Tanzania, Bossou’s now an elite defender in the league. The reversal in fortunes has seen him acquire the nickname Kaka Jambazi (Thief Brother) because, out of nowhere, he has stolen (!!!) the hearts of Yanga fans. It’s a nickname so contrived, with all the nuances of the Swahili language, that a direct translation, or any attempt to explain it, doesn’t really do it justice. Its done no harm to his place in this XI, though. To many Seydou Keita was Mali’s talisman in the noughties, but there’s a sub-group that think that there was another player that was as crucial as Keita, if not more so, but just never got the credit he deserved because he was playing his club football in Denmark and Sweden. Meet Adama Tamboura. Named in the SFG teams of the tournament for the 2013 and 2015 editions, it’s unquestionable that Adama Tamboura is a great footballer. The left-sided Dani Alves’ freewheeling down the flank over the course of 90 minutes inevitably led to goals and the creation of chances, adding excitement into a team that bored many to tears. Anyone who has watched Kabore in a Burkina Faso jersey will testify what a fine playmaker he is or, to put that in hipster parlance, a pure regista inspiring several registi in streets of Ouagadougou and beyond. Yet anyone who watches him at club level will categorise him as the prototypical African Defensive Midfielder, a perfect case study in the misusage of African creative players for the African Football Registi Liberty module they will be teaching at SOAS from the year 2050. At each recent AFCON viewers have wide-eyed wondered what on earth he is doing in Russia. Like the hipsters, football fanatics are quickly realising that this is a man who belongs at the elite level of football, like in the knockout stages of the Champions League, supplying superhuman attacking talent with balls begging to be finished. A total of six years at Zamalek and Club Africain came dangerously close to costing Mendomo a place in this prestigious XI, but he made it past our panel because his stints there fell just before the mainstream emergence of football streams. Quick-footed, powerful and unflustered on the ball, Mendomo’s hairstyle and physique makes him look like a modern day, hyper professional Cyrille Makanaky; he definitely wouldn’t have looked out of place in the great Cameroon sides. He’s quite obviously good at football, having lined up alongside Alex Song, Nicolas Nkoulou, Aurelien Chedjou and Georges Mandjeck at the 2008 Olympics. While his team-mates have gone on to form careers in major leagues in Europe, Mendomo hasn’t been quite as eager. He has stuck to North Africa and the gulf – and that’s not because he’s not good enough for Europe. Hipsters get the sense Mendomo is aware of the cautionary tales of the artistic African midfielders that moved to Europe. Mainstream football fans weep when they compare recent Cameroonian sides to the ones of yesteryear. The endless supply of technically limited, Eyong Enoh-cloned midfielders perpetually begs the question of where the creativity and cavalier style has gone. Any hipster will know that, just like hip hop isn’t dead if you look hard enough, Cameroonian football also isn’t dead: the solution has always lied in the exiled, criminally underused Achille Emana. While countless creative African footballers have been victims of pigeon-holing in Europe, Emana, with his proud skinhead, can boast that he is is the only survivor. Known as ‘The Painter’ because of his ability to paint a perfect picture in the final third, Emana has played in an advanced midfield role wherever he has gone, including the creative hub that is Spain, unlocking defences with sublime vision. The Cameroonian has also sailed to waters few African players have got to, donning the colours of Atlanta and Cruz Azul in Mexico, winning the CONCACAF Champions League with the latter. Arsene Wenger nearly signed Zlatan Ibrahmovic, Cristiano Ronaldo and Yaya Toure. What the fake news mainstream football media won’t tell you is he also nearly signed TP Mazembe talisman and captain Tresor Mputu AKA The Next Samuel Eto’o (Claude Le Roy, 2006). A successful trial with Arsenal in 2008 saw TP Mazembe pull out of the move as the £1.25m offered didn’t meet their valuation of their player. The all-time top scorer in African club competitions, African football hipsters know Mputu deserved to be bought for a world record fee. Besides, he would have been converted into a right back anyway. A silky, skilful attacking midfielder, there’s no excessive pace to Mputu’s game, giving another emphatic middle finger to modern football. He’s undoubtedly Africa’s answer to Juan Roman Riquelme, Francesco Totti and Benjamin Nivet, the nigh extinct set of engaches that use brain over brawn. While DR Congo have risen to continental prominence in the last 2 years, Mputu has disappeared from the spotlight after making a move to the Angola league, though he has now returned to TP Mazembe. The cost is that it hasn’t built on his profile beyond Africa, but that move only accentuates his hipster rating. We know the Sudanese League has the best fans in Africa. The organisers can schedule a local match on a European CL night and still expect a sell-out. This is because the crowds turn out in droves to watch players like Mudathir ‘Careca’ El Tahir strut their stuff. Because when you can watch homegrown hero Careca, why do you need to tune into inferior European football on cable television? He is, of course, also better than original, Brazilian Careca. The Al Hilal forward nearly didn’t make it past our panel because of his basic, modest haircut – the kind of haircut done at home by your mum – but playing for Sudan and the manner he tears the league up saw him pull through. And then there’s his connection with the fans. El Tahir signing a contract is a sight to behold, with several club staff and fans in attendance to witness it, followed by the fans throwing him into the air in delirium, Contracts in Europe, or anywhere else in Africa, are not greeted with as much tangible fanfare. Karika signing a new 3-year contract last year. The man affectionately known as “Messi-akni” seemed destined for big, great things when dribbling past defenders for fun during his time at Esperance. So it came as a shock to many of his admirers when, aged 22, he joined Lekhwiya in Qatar rather than Barcelona or Real Madrid. But we know what his plan is. Every 2 years, at an AFCON, he shows that he is still capable of making the step up to Clasico level with wondergoals and crowd-warming exuberance on the ball. One day the money will bore him and he will join either Barca or Real Madrid and show that he is as good as Messi and Ronaldo. Before AFCON 2013 no one cared for him, but then his all-action performance against Ghana in the semi finals lifted his career to unprecedented heights. Now wherever he plays in Africa he gets a standing ovation, which makes him dangerously close to being too mainstream for this list. 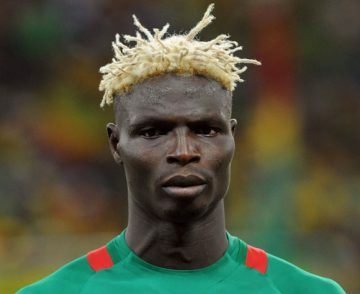 The battle between Bance and Kidiaba for Hipster D’Or would certainly go down to the wire. Though a strong case can be made for Kidiaba for fending off European interest and his eccentricities, Bance’s sheer volume of countries and his hair makes him a sure winner in the hipsters that prefer their Ballon D’Or winner to be globalised. Indeed, Bance has graced 12 countries, including Latvia, Kazakhstan, Finland and Germany, where he was coached by Jurgen Klopp at Mainz. That latter piece of info is a massive tick. Unlike the vast majority of European-based sub-saharan player, he’s done the unthinkable: he’s come back to the continent, first with Chippa United in South Africa and now ASEC Mimosas in Ivory Coast, no doubt to spread the gegenpressing philosophy.